I'd seen speculation that Apple was going to drop $500M on Anobit over the past few weeks. Ars Technica also published a piece believing the acquisition to be true, and it looks like the office of Israel's Prime Minister tweeted a bit of a confirmation (Anobit is based in Israel). I looked at Anobit's extremely vague technology descriptions and dug a bit into their patent portfolio to better understand Apple's motivation behind the acquisition. If you've followed our SSD coverage over the years you'll know that NAND endurance was a valid concern in the early days of consumer SSDs. When Intel arrived on the scene with the X25-M, its controller technology included a number of enhancements to work around common NAND errors and degradation over time. Other companies followed suit and eventually NAND error correction and reliability were major selling points of SSD controllers. More recently, Micron announced that it would be baking ECC technology into a separate line of NAND called Clear NAND. Micron believes that in the future if you don't have access to a controller that does significant ECC or a NAND solution that includes active ECC technology that you won't be able to deliver competitive NAND based storage. Today not much of this is necessary for consumer SSDs, even forthcoming 20nm IMFT NAND is still good for 3000 - 5000 program/erase cycles, which is more than enough for client use. However if you're using greater than 2-bit-per-cell MLC (e.g. 3-bit-per-cell MLC) then the need for better error correction is more urgent. Smartphones and tablets need not-insignificant amounts of NAND (16 - 64GB for high end devices today, twice that next year). The cost of this NAND isn't all that much in the grand scheme of things, at the low end you're looking at several dollars and at the high end the cost is more than offset by the ridiculous increase in device pricing. The problem is not at the high end but what happens when you start selling cheaper phones. If we are indeed heading toward a future where mainstream computing is done on smartphones, then we're also headed toward a future where all smartphones need dozens of GBs of NAND on-board. That includes the ultra cheap devices as well as the high-end flagships. Price sensitivity in these devices means that the high grade, compute NAND used in SSDs isn't what gets used by smartphone manufacturers. Instead you get the mid-grade stuff at best, but more likely you find some slow, 3-bit-per-cell NAND in the cheaper devices. There's no room (physically or budget) for sweet SSD controllers by Intel, Marvell or SandForce, thus NAND management is typically handled by an eMMC controller (or something similar) integrated into the phone/tablet's applications processor (e.g. Snapdragon, Tegra 3, A5, etc...). 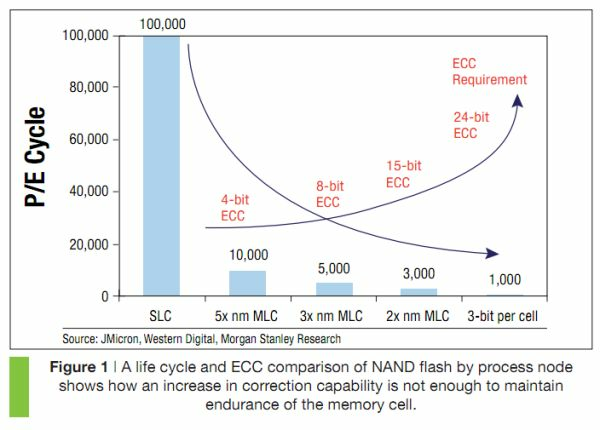 Cheaper MLC NAND trades off endurance and performance for cost. How do you get to have your cake and eat it too? Well if you're set on using cheaper NAND, you have to do more processing on the controller side to clean up the data you're reading back from the shaky NAND. This isn't a problem on day one, but it becomes an issue over the months/years as you've written more data to the NAND. Cells have to be periodically refreshed, storing redundant data becomes necessary, the controller must recover/reconstruct lost data, etc... Every company has their approach to dealing with these problems. It was the first solutions to these problems that allowed consumer SSDs to use cheaper MLC NAND, and the solution to the smartphone/tablet issue is of a similar nature. Anobit appears to be applying a lot of signal processing techniques in addition to ECC to address the issue of NAND reliability and data retention. In its patents there are mentions of periodically refreshing cells whose voltages may have drifted, exploiting some of the behaviors of adjacent cells and generally trying to deal with the things that happen to NAND once it's been worn considerably. Through all of these efforts, Anobit is promising significant improvements in NAND longevity and reliability. At the high end Anobit promises 50,000 p/e cycles out of consumer grade MLC NAND, and in the smartphone/tablet space Anobit promises more useful lifespan out of 3-bit-per-cell MLC NAND. As for why Apple would want Anobit, the potential reasons are huge. First the company was a cheap buy for Apple, although expensive if you look at the market as a whole (SandForce went for ~$370M). If all Apple gains from Anobit is bringing some smart NAND folks on staff the cost won't really break the bank. The obvious fit is to integrate Anobit's technology into Apple's ARM based SoCs. These SoCs already talk to NAND directly and integrating better error correction/reliability processing into the SoC just makes sense. For all we know, Apple already uses this technology in its SoCs and is simply acquiring Anobit to make it more difficult for competing SoC makers to do the same. Integration and assimilating value are the cornerstones of building a good SoC, this move makes sense (assuming Anobit's technology is actually good). Note that if you look at the graph above, continuing to use 3-bit-per-cell NAND requires more than just standard ECC. It's clear Apple wants to continue to use value NAND in its devices, Anobit is simply a guarantee that it will be able to do so in the future. At the other end of the spectrum, Anobit has enough technology to build a decent SSD controller (it already appears to do so for enterprise SSDs). If Apple wanted to really commoditize SSDs, it could use Anobit to produce its own SSD controllers. Apple would then simply buy NAND from memory vendors instead of the present day solution of buying a complete SSD solution for its Macs. This would shave a not insignificant portion of the BOM (bill of materials) cost of SSD production, which would help Apple transition to SSDs in more of its systems. This is more of a longshot as far as I'm concerned as, at least today, there are a lot of low-cost, competent controller makers in the SSD space. Apple has been internalizing many of the pieces used in its SoCs over the past few years. It even owns a 9.5% stake in Imagination Technologies, the GPU company that supplies IP for Apple's SoCs. While I understand Apple's motives from the standpoint of a mostly vertically integrated hardware/software entity, there is a bit of defocus that comes with going too far down this path. I'm still not sold on the idea of Apple becoming a full fledged silicon vendor. It makes sense today, but as these SoCs become hugely complex, billion+ transistor devices I'm unsure if Apple wants to assume even more of the burden involved in bringing one of those parts to market. Until we get to that point however, acquistions like Anobit come relatively cheaply for Apple and should help guarantee NAND reliability and performance for its more cost sensitive products (particularly as NAND geometries continue to shrink going forward). If Anobit's technology is up to muster, it should also mean that Apple will be able to continue to scale up NAND capacities in its devices without resorting to increasing device costs. NAND is ultimately driven by Moore's Law, however reliability doesn't follow the same curve by default. Integration of Anobit-like technologies are necessary to ensure it does. Seems like Apple is the one that could do it first, especially with this new acquisition. Making their own controller would no doubt reduce their cost per unit, hopefully combined with process shrinks making SSD's cheap enough per gigabyte to replace the hard drives in the MBP's. Apple should be able to easily offer all their computers with SSDs. Shoot, they wont even have to raise prices even if they plop a nice 256MB or higher top of the line drive and still make a higher profit on their computers than their competitors. "You know that wont happen. Expect Apple computer's prices to rise if they do add SSDs to the base models." Your comment is invalid. The current Macbook Air is a Sandy Bridge platform. The earlier MBA's didn't use the current Intel platform for the sole reason that Intel's HD Graphics with Arrandale didn't meet Apple's expectations with regards to performance. Sandy Bridge obviously did. It had nothing to do with SSD's. They later integrated them into the design, because they wanted something smaller than a 1.8" mSATA SSD because those didn't fit into their design goals for the newer Air models. LOL wtf are you talking about? You can claim whatever reason you want, but they did recycle an almost 2 year old CPU for your precious mac air crap. They used a 1.86 GHz (SL9400) or 2.13 GHz (SL9600) Intel Core 2 Duo with 6 MB on-chip L2 cache in mid 2009 and recycled the same exact processor for the next generation Air that came with a SSD instead of a mechanical drive in LATE 2010. Why with the vitriol? Nothing H.A.L. 9000 said was false, and I think it's a little misguided to call him a liar. There have been three major product versions of the MacBook Air. The first, used the C2D chips you are talking about, while the second did as well, but substituting in an SSD for r/w performance gains. The third version, however, uses Sandy Bridge ULV chips with the SSD again. Yup. Just another demonstration that haters have a very serious problem with telling the truth. That's part of why I screen for platform-hate when I interview people and reject candidates who are haters... of ANY platform. Haters are dishonest to the core, argumentative, disruptive, know a lot less than they think they do (incompetent) and in a company whose products are multiplatform, more likely to scrimp on efforts to support IOS/OSX (or even actively sabotage those efforts). They're also MUCH more inclined to run off their mouths and make the company look bad; haters, like small children, don't know when to shut up. article: " For all we know, Apple already uses this technology in its SoCs and is simply acquiring Anobit to make it more difficult for competing SoC makers to do the same. " I see, so APPL is so evil it not only wants the best tech in it's crap, but it will spend half a billion JUST TO BLOCK OTHERS FROM HAVING THE SAME THING IN THEIRS.